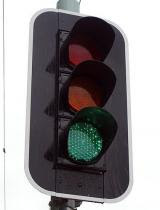 IBM has filed a patent application for a traffic light system that can remotely stop and start the engines of vehicles, with the aim of increasing fuel consumption efficiency at busy intersections. When the lights turn green, a “start-engine notification” would be sent to the front vehicle to start its engine first, and a signal would be sent to the second vehicle in the queue an “optimal time” later, and so on. The IBM patent says the system could be applied to traffic signals at intersections, railway crossings, or other transportation signals for “indicating correct moments to stop and to proceed.” Its stated aims are to reduce wastage of fuel and optimize the movement of vehicles through the intersection or crossing. The patent states that with “increasing vehicle usage there may be more traffic and longer wait times at traffic signals,” resulting in wasted fuel if the vehicle engines are kept running. It acknowledges that most drivers do not turn off their vehicles’ engines in such situations, and that more fuel may be used in restarting the engine than in keeping it running if it is stopped for too short a time. The system would therefore take into account the time remaining before the signal changes to determine if the vehicle’s engine should be stopped. The proposed traffic light system would gather data from traffic signal clocks, GPS data on vehicle positions, traffic load information (perhaps from weight sensors in the road), cameras, and/or “other data obtainable from sensors embedded at the intersections.” The communications system may use Wi-Fi technologies, a cellular network, or satellite communications. In one proposed model the method would be made available as a “service” that vehicle drivers would need to sign up for. The stop/start-engine notifications could switch the engine off and on automatically, or they could trigger alerts to the driver to turn it off/on manually. The idea is at the patent application stage, and the patent only covers the method but not the communications technology. Many patent applications never proceed any further, and only time will tell if this will be one of them.